Mosaic art for you, your garden, and it's wildlife. If you love your garden, and it's wildlife, then there's something for both here at JoSara,co,uk. 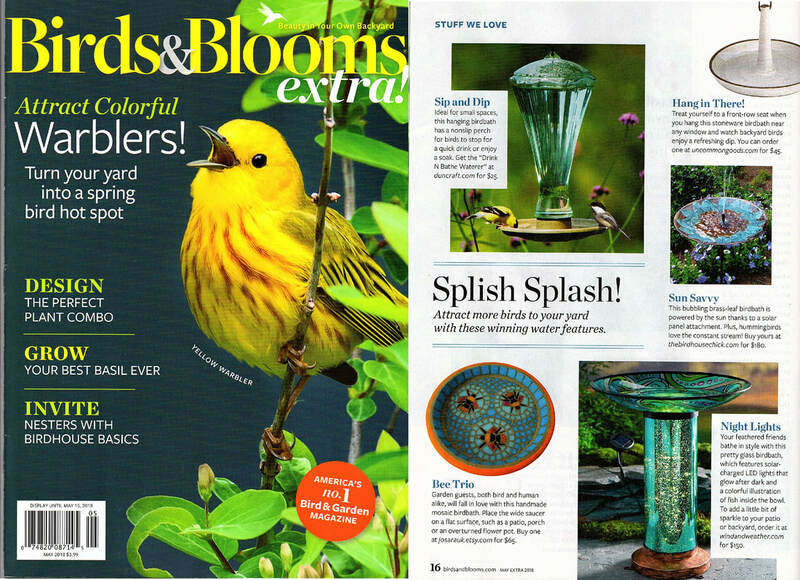 Lovely mosaic ﻿hanging garden ornaments to decorate walls and fences﻿, there's a wide selection of mosaic bird bath designs, plus smaller mosaic water dishes, both of which are perfect for garden birds and mammals including hedgehogs to use, and all are a little bit of mosaic art for you to enjoy too. All the items are handmade by me, and are my own original mosaic designs, so you'll be getting something very unique. I am passionate about offering the best quality products I can, so all the materials are sourced by me and thoroughly tested to ensure they are safe, suitable and long lasting. Find the perfect garden or wildlife gift and no matter what size or style of garden it's going to live in, romantic cottage to modern and contemporary, there'll be a design that will be just right. Hop over to the SHOP and have a browse. 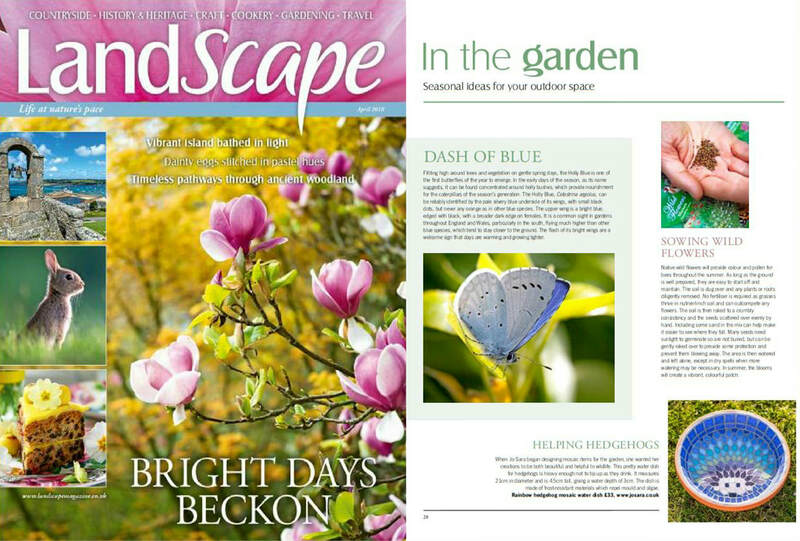 Rainbow Hedgehog Dish Featured in Landscape Magazine - Find it here. 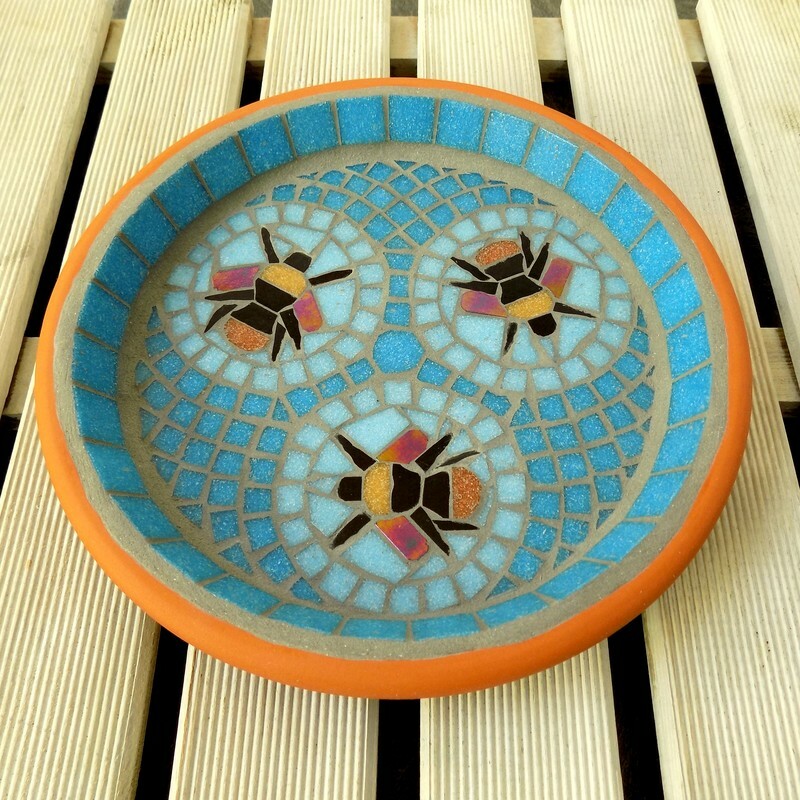 If you have a look at my Feedback page you'll see some great ideas of how you could display the bird baths with loads of different items used as stands, including photos of how many customers' have chosen to place their purchases in their own gardens. How to Order Pop over to my shop, choose your item and click on the Buy It Now button to be taken to Paypal for payment. Each item has to go through as a separate transaction.You can still pay with a Debit or Credit card through Paypal without setting up an account. Full instructions on how to pay without an account here - No Paypal Account? - Or look for the 'pay with a card' link on the checkout screen.